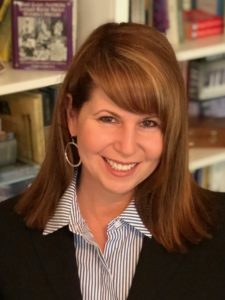 You’ve written your book, you’re doing promo, you’ve updated your business card, butnow, how do you carry your card or display that shiny new badge of honor to make sure you actually make use it? 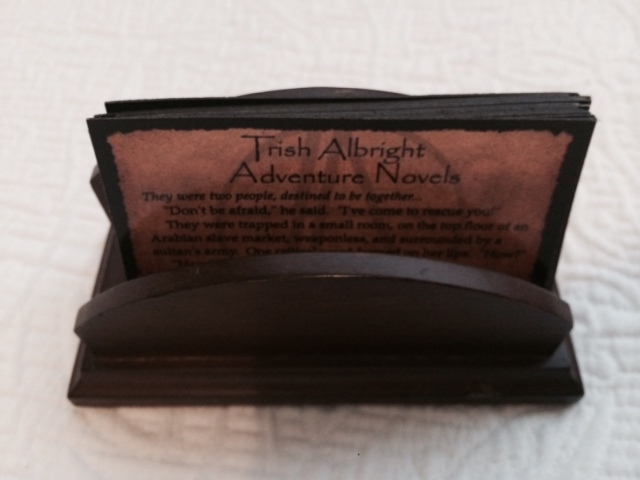 A simple, wood business card holder, perfect for cards about my adventure novels. This is a small holder that sits on your desk or that you can carry in your purse or murse, to display or protect your business card. A silver business card holder that slides into your purse and also has a mirror to check your smile before handing out a card. 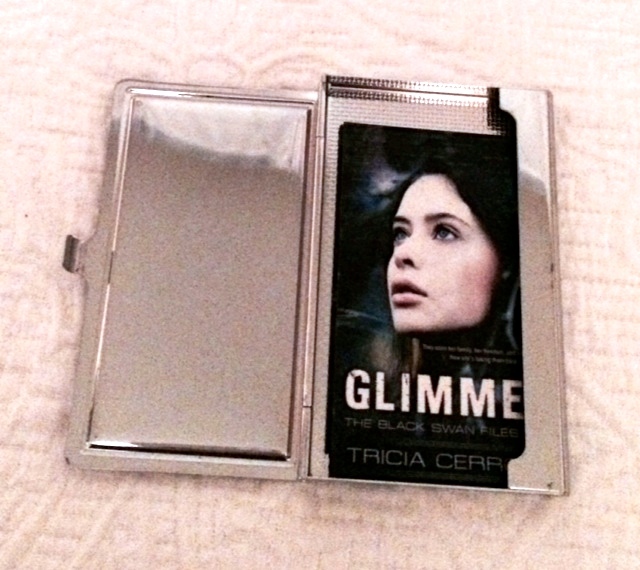 For the purse, it means your cards are always in pristine condition and don’t get bent, worn, spotted, etc. As a display on your desk or in your office, it’s a reminder of your accomplishments and can be reflective of your personality and sense of design – therefore a personalized gift. You can even have most monogrammed. As always, when purchasing, think about the person you are giving it to and how much budget you really have. For the person who has everything, think about what their office feels like, then find something suitable. Some might want the card displayed, while others put them snug in a box better suited to their room decor. 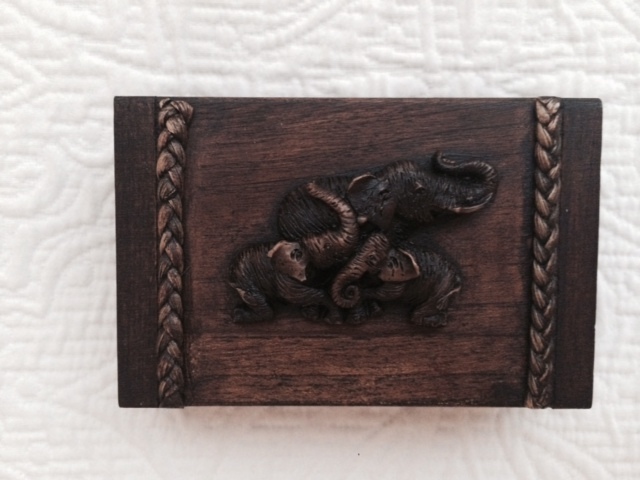 A fun business card box from Thailand with carved elephants on top. 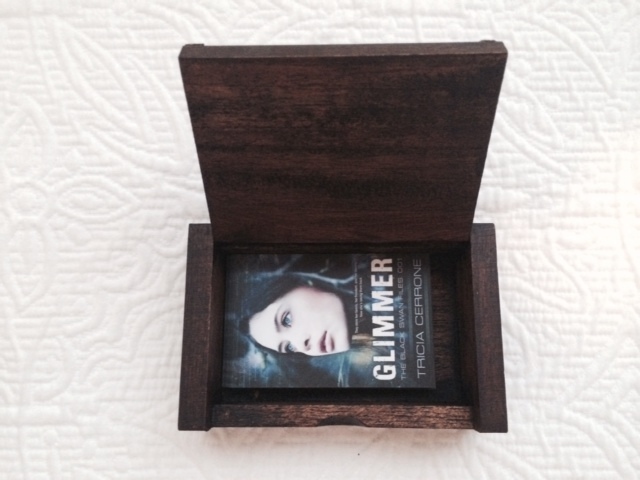 A business card holder from Thailand with cards from my latest book, GLIMMER. You can also be a little more creative with boxes, and find some really unique ones that might not have necessarily been designed for this purpose, but are perfect anyway. Approximately $2.00 – $40.00 You can find some very inexpensive card holders, but think about making them a little more special by adding a monogram. Include a note like, “Just a little something to celebrate your success.” Or, for a sexier tone, “This is great to hold cards, but I’m still the best to hold you.” A note like that can make the person think of you every time they look at that small object of affection. And writers do appreciate the literary effort! Visit tomorrow for the 5th day of Pre-Christmas.